Honky Tonk Country superstar, Toby Keith is coming to rock Farm Bureau Live on Friday 8th July 2016! After the enormous success of his 2015 Tour across North America, the sensational Toby Keith is once again hitting the highway to give fans the time of their lives. Toby Keith is one of the most popular Country artists of the last decade and counting, with his upbeat party anthems such as "Red Solo Cup," "Drunk Americans," "Good As I Once Was"…. expect to hear all of these plus many more LIVE on this very special summer night! Since the very beginning of his career, Keith has worked hard to keep at the top of his game. In the early 1990's, he begun by taking his music to the legendary Nashville, Tennessee. Starting to busk and perform around Music Row, he slowly made a name for himself on the scene. Luck was on his side and in just few years, Toby Keith had signed to Mercury Records, where he released his debut single, "Should've Been a Cowboy." The track was a number 1 hit on the Billboard Hot Country Songs chart in 1993! 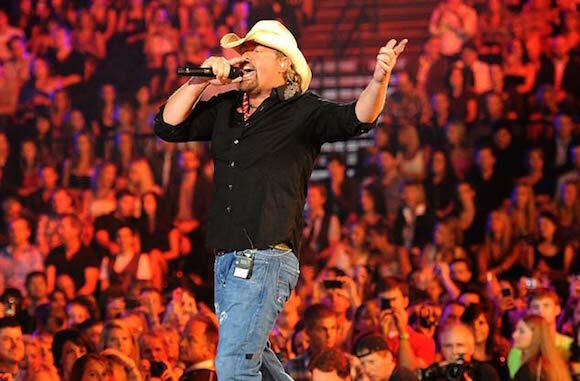 Toby Keith has released around an impressive 20 albums and is still going strong. "Drunk Americans", the lead single from his eighteenth studio album, 35 MPH Town encouraged him to be inducted into the Songwriters Hall of Fame in 2015 and this year he returns to the stage bigger and better than ever!